Back here I showed you a photo of an egg as my response to the boot camp prompt 'picnic'; I mentioned at the time that it was part of a lesson. The watermelon was part of the lesson too! We had a guest in from a local university, and she talked to Year 6 about the structure of the brain, and the importance of protecting it. She explained to them what functions would be lost if different parts of the brain got damaged. We illustrated this by throwing the watermelon from the top of a ladder - useful opportunity to stress the importance of wearing a helmet when cycling! Finally, we provided materials for each group to try to protect an egg - once again, we threw them from the top of that ladder. It was such a fun, interesting lesson! I learnt a lot myself, the pupils were all engaged, and we all thoroughly enjoyed ourselves. Oh, and in case you were wondering, all but one of the eggs got broken - which really showed the pupils how fragile they were, and made them think again about their own fragility. That's quite a striking image. Helmets are definitely a good idea! Great way to illustrate the point!! What a great lesson! Those are the kind of lessons that stick with kids, and it sure is an important one. Great post today! I love the watermelon lesson. In our middle school, the 8th grade science class always has a competition to see who can protect an egg being tossed off the top of the gym roof with the least amount of protection. That's a cool way to teach this subject! I like the idea of giving them a task to protect their eggs, before they are thrown from the ladder. 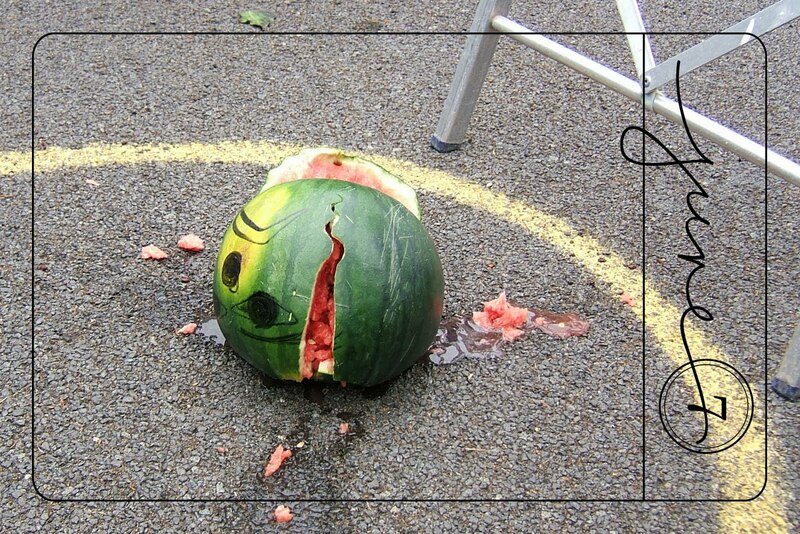 Still, I feel sorry for the watermelon there... it looks rather upset! Brilliant idea re the watermelon but I do think you could have TRIED to put back it together again (echoes of Humpty Dumpty here). Yes poor watermelon, but great lesson!